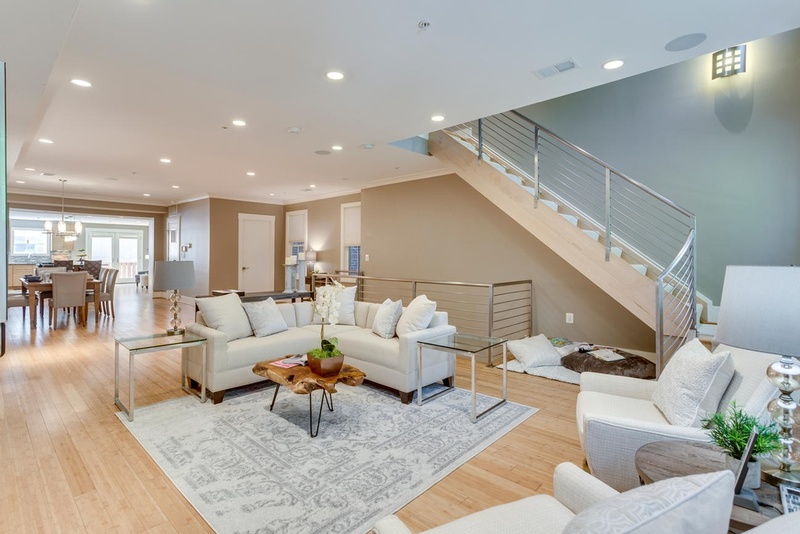 By Sandra Hambley | May 15, 2018 | Posted in " Row Home, Staging, Washington DC "
With a listing price of just under $4 million, this gorgeous row home located near the Convention Center in Washington DC required a very specific look to attract the proper buyer. The home has been completely remodeled in a modern style with bamboo flooring and bamboo kitchen cabinetry so the furnishings and decor needed to be complimentary. Typically, transitional furnishings are used in staging across the board, however, for this property we wanted an urban loft, industrial look with heavy elements of reclaimed wood to create a city, hotel luxe style. As with all DC properties, this one is long and narrow but is completely open concept on each level, so continuity in color and design selections was critical. The row home had several open areas that needed a defined purpose such as a reception area, which includes a full bar service area, pub tables, stools and several comfortable seating areas for additional entertaining. It also boasts an in law suite with kitchen and living quarters as well as 3 outdoor spaces, which are highly sought after in the District.